So you’ve got your new iPad Pro and are raring to try out all the sweet new features. But of course, you want to make sure you’re getting the most out of your new Apple gadget! We compiled a list of some of the best and most essential iPad Pro accessories to make using your new tablet a dream. If you plan to use your iPad Pro on the go, there’s a good chance at some point you’ll run out of power and there won’t be an outlet in sight. That’s where portable batteries come in! They make traveling with your gadgets super easy. You never have to worry about your tablet dying on you again, as long as you’ve got your portable battery handy and charged up. Check out the Anker Astro E7 Charger, which holds 2 full charges for your iPad. It’s perfect for long trips or people who constantly forget their charger! Keep it charged up and in your bag wherever you go. Don’t just use your fingers, as tempting as that may be! It leaves smudges, oil marks, and other nasty traces on your screen. 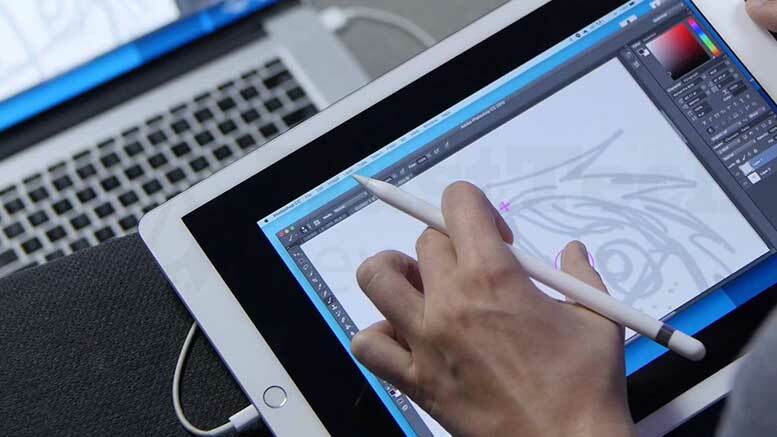 To really get the most out of your iPad Pro, get yourself a good stylus pen! For a reliable and affordable option, consider the Applydea Maglus. It’s got a keyring attached, so you’ll never lose it. If you’re looking to invest in a top notch stylus, buy the Apple Pencil. It’s designed specifically for the iPad Pro and boasts no lag time. It also has special sensors that allow you to draw lines of different thickness. Plus, it has 12 hours of battery life and can be charged via the Lightning Port. If you’re a painter or graphic artist though, you should check out the Sensu Artist Brush and Stylus. This stylus actually has a brush attachment, which makes it a better option for the more artistically-inclined iPad Pro user. It’s also much more affordable than the Apple Pencil. For a better view of videos and certain iPad features and programs, you’ll need a good tablet stand. Most stands offer a variety of positions to suit your desired perspective. The Octa Spider Monkey allows you a limitless range of positions, though, thanks to its flexible steel frame. The neck is adaptive and can be wrapped, bent, and shaped to fit anything from a bedpost to a chair arm. The clamp also offers 360-degree rotation, so you can achieve precise adjustment for perfect perspective. If you prefer a more straightforward and functional stand, try the Logitech Base Charging Stand, which uses the Smart Connector. You simply place your iPad Pro atop the base and it charges it while you use it. If you’re looking to replace your laptop with your new iPad Pro, a keyboard is a necessity. It makes typing and communication ten times easier. While both are great options, the Logitech Create Keyboard is a good alternative to Apple’s Smart Keyboard. It features a protective case that encloses the back of your iPad Pro, so you get extra protection. Plus, it’s more affordable than the Smart Keyboard. Incipio’s ClamCase+ Backlit Keyboard is also a wonderful option. The keyboard attaches to the tablet via a 360-degree hinge, so you can achieve optimal viewing no matter your perspective. There’s also a built-in battery that gives your iPad Pro extra juice when needed. Protect your investment with uBreakiFix tempered glass for your iPad Pro. Our glass covers are high-quality and guaranteed to protect your device or we’ll repair your screen for a highly discounted price. You can learn more about uBreakiFix tempered glass here or stop in at any location.